Nigel Lawson, ex-Chancellor of the Exchequer, recently criticised the UK membership of the EU, the media has covered his mainstream view as if he is a bad boy starting a fight in the school playground, but is he right about the EU? What has changed that makes EU membership a burning issue? What has changed is that the 19 countries of the Eurozone are now seeking political union to escape their financial problems. Seven further EU countries have signed up to join the Euro but the British and Danish have opted out. The EU is rapidly becoming two blocks – the 26 and Britain and Denmark. Perhaps it is time to reconsider EU membership. What would be the consequences of withdrawal? If you know of further benefits of EU membership, please add these to the comments section at the end. This level of deficit is unsustainable. Add the £10 billion that the UK pays for being in the EU and the total deficit is about £116 billion. 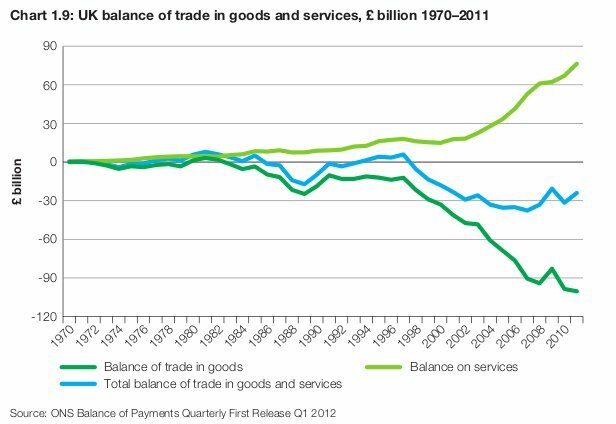 Britain cannot survive with a £116 billion annual balance of payments deficit (See Note 4). The 2014 deficit is about 5% of GDP whereas the pro-EU IPPR report, “Staying in: A reform plan for Britain and Europe” calculated that “It is estimated that withdrawal could result in UK GDP being permanently lower by 2.25 per cent.” You can be 2.25% worse off “getting out” or 5% worse off “staying in” – the choice is yours. It is sometimes said that the EU is the major trading partner of the UK and so the UK would “lose out” if it left the EU. 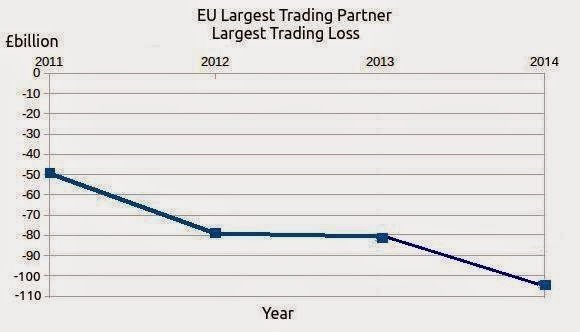 The truth is that the EU is indeed the major trading partner of the UK and this results in huge losses, the UK would gain billions if it left the EU. 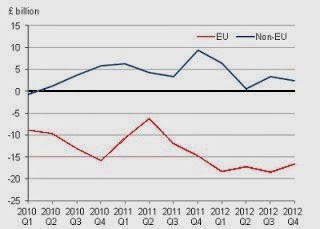 In 2014 the UK deficit provided about 50% of the Eurozone’s balance of payments surplus and was the Eurozone’s largest source of net export revenue. It is the EU that would lose out if the UK decided to leave. In fact the EU would help the British economy if it raised tariff barriers and the UK responded in kind. On further analysis (see Note 1) our relationship with the EU is destroying our manufacturing industry because £77 billion of the manufacturing deficit was with the EU. 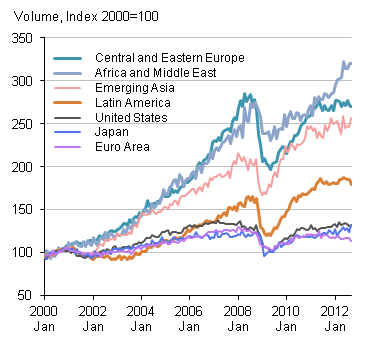 Imports from Germany are a large contributor to the loss of domestic manufactures. Germany is anomalously competitive because it is in the Eurozone – if Germany still had the Deutsche Mark it would be valued much higher than the Euro and this would make German manufactures far less attractive. The Euro is a way of allowing the Germans to have a huge advantage in currency exchange – they can use a low value currency (relative to the DM) without paying the social costs. 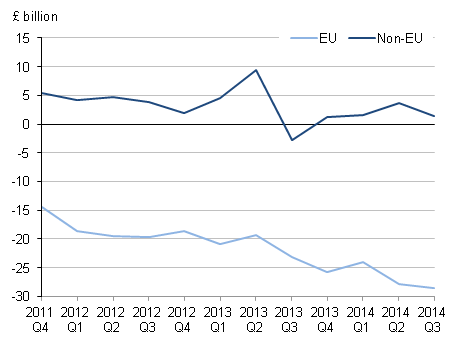 If you have any doubt about the truth of these terrible balance of payments figures follow the links above to the ONS data, also see The Benefit of the EU for UK Trade and Industry where the strange negative effect of the EU on UK exports is noted. Notice that only the United States appears in both lists and 9 out of 10 of the countries with the highest income per head of population have little international influence. It is not necessary to live in a country that has international influence to be wealthy. The argument that we can only be wealthy in a large, influential country is simply untrue. Each citizen has more influence in a small democratic State than in a large State. An Indian person is one of about 1.5 thousand million people and has a very small voice indeed. Tariffs were an important reason for voting to become a member of the EEC, however, in the past 20 years the EU has striven to remove tariffs in its trade with the rest of the world. Most of these deals are bi-lateral and most non-EU countries do not pay any membership fees. See The Myth of EU Tariffs. Fear of Tariffs is no longer a valid reason for wanting to be part of the EU. It is interesting that Japan is about to sign a Free Trade Agreement with the EU so the argument that the UK benefits from selling tariff-free Japanese cars to the EU is history. Nick Clegg has famously said that 3m jobs would be lost if the UK withdrew from the EU, the original authors of the report that Clegg was quoting deny this would be the case. No one but Clegg and those who quote him has ever believed that 3 million jobs would be lost. The report that Clegg quoted was produced in 2000 and the terms of trade have got precipitately worse since then so that the UK would gain jobs by leaving, not lose them. Furthermore the EU has concluded Free Trade Agreements with much of the world since 2000 so the figures are entirely inappropriate. Most importantly, the entire extra cost of export tariffs to the UK economy would only be £7.4 bn even if there were no negotiations to lower the tariffs. However, the EU has Free Trade Agreements with much of the developed world so the cost would be much less than £7.4bn. Furthermore the UK pays £11.3 bn a year to be in the EU to enjoy this £7bn of “relief” which other countries get for free. The EU does not have an insurmountable tariff barrier for foreign imports and being IN the EU is more expensive than being OUT. If you like this article, tweet it to your friends using the button at the end! Send a link to them by email and ask them to pass it on. The BBC will not tell them the truth and if you do not tell them who will? Spread the truth. The EU accounts have not passed their audit for 19 years. The former European Commission Chief Accountant, Marta Andreasen, said of the latest failed audit that: ‘If this report, outlining as it does the continued gross mismanagement of EU funds, doesn’t set alarm bells ringing in Downing Street then nothing will.’ This mismanagement and probable corruption is always ignored in discussions of the EU. The EU is not a place where politics and government are cleaner and better, it is the opposite. As Daniel Hannan put it: “The EU is no longer an ideological project, but a racket – a mechanism for redistributing wealth to people who, directly or indirectly, are on its payroll.” The EU is certainly no utopia where everything is fairer and better than the UK, it is the opposite. The pro-EU lobby in Britain perpetually stress that Europe is not going to form a “superstate” based on the Eurozone. What do the Europeans say? All of the leading figures in the Eurozone are crystal clear that they are working towards political union. In Note (2) you will find a long list of quotes and references showing that Angela Merkel, Francois Hollande etc., etc. are all committed to European political union. Merkel says: “we need a political union first and foremost” The only real mystery is why this is not just common knowledge in Britain as it is common knowledge in Europe. 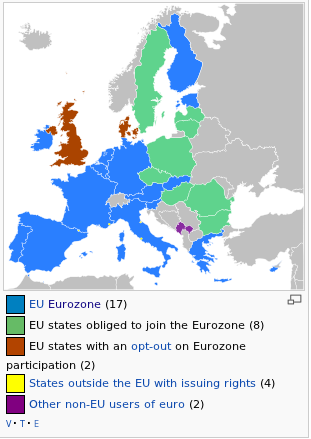 Britain and Denmark are the only countries that opted out of the Eurozone. This means that the other 26 member States are now supporting each other on financial policy within the EU and moving towards full union, sometimes against the interests of the UK. Britain can only opt out of full Union in the long term by withdrawing from the Lisbon Treaty, signed in 2007, which is a treaty for full Union that came into full effect in 2014. 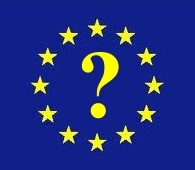 Few people seem to understand that the EU really will be European “Union”, not a group of separate countires. The UK really will be gone as an independent country. Since November 2014 EU decisions are based on majority voting without a veto. The UK has only one in twelve of the votes. As the EU progresses towards full union the voice of the UK will disappear entirely from the world stage. The UK economy will be aligned with EU norms and foreign policy and defence will be EU matters. Britain will have little voice in its own affairs, let alone those of the world. (This is all described in the EU Constitution – see Where is the EU going?). Supporting the EU is indeed supporting the end of the UK. Democratic Deficit As pointed out above, it is undoubtedly the case that the EU will become an ever closer political union. Britain will be an offshore island with special needs, the UK in Europe will be more exceptional than Scotland in the current UK but the Scots endlessly claimed there was a democratic deficit until they obtained near independence. The UK will need to be independent once it is absorbed by the EU and the movement for independence will grow decade by decade. If we ever joined a United States of Europe we would leave it again – the German majority in Europe will not know what is best for an island in the North Atlantic. Law The European Union has a legal system based on Romano-Dutch Civil Law and its successor, the Napoleonic Code. The English use Common Law. English law says that whatever is not illegal is permitted. European Law says that if something is not specifically permitted under some codified rule, then it is illegal. This difference in legal systems is so profound that the UK should never have joined the EU. British politicians have been desperately trying to amend English law so that it aligns with European Law by attempting to abolish trial by jury and by accepting that EU Statutes override Common Law (See Note 3). Britain has the paradox that, for at least 50% of the law, its highest court, the European Court of Justice, is based on Civil Law whilst its ordinary courts are based on Common Law. This means that appeals to the European Court can override English court decisions purely on the basis of a mismatch between the two systems. There is now a large body of EU regulation controlling life in the UK. Some of these laws have good effects, some bad but what they all demonstrate is that the UK is being governed by the EU. The British legal system is fundamental to our culture and constitution, it should not be abandoned. Patronising lawyers will tell you that they can sort out the system to their satisfaction, but, of course, we do not want it sorted out to their satisfaction.. In particular the British have trial by jury but almost all EU countries use trial by judges controlled by the state without juries(see Note 3), trial by jury is fundamental to the British idea of freedom. It is the clumsiness of the European Civil Law system of regulation by Statute that is enveloping British industry in “red tape”. See The Common Law and Civil Law Traditions. and The British Constitution Incidentally, the other major court, apart from the European Court of Justice, is the European Court of Human Rights. It is a non-EU body that all EU members must agree to recognise. However, this has been superceded by The EU Charter of Fundamental Rights that was implemented by the Lisbon Treaty and contains far reaching definitions of “Rights”. Working out the proportion of Laws in the UK that are due to the EU is difficult because, as pointed out above, the EU implements law directly as Regulations rather than using the UK system of Acts that must be interpreted and if necessary, judged in Court. About 53% of new UK laws are due to EU Regulations, a further 10-14% of UK Laws are implementations of EU Laws and 9-14% of UK Regulations are EU regulations that required further statutory approval in the UK. Given that some EU regulations do not apply to the UK (such as those about olive growing etc) the fair figure for the proportion of government due to EU Laws is probably about 50%. We are currently half-governed by the EU. Do you want this to become full government from Brussels? See UK Law: What proportion is influenced by EU? and How much Legislation comes from Europe? Free movement of Labour All 28 countries of the EU teach their children English at school. The British do not teach 27 languages to their children. This creates a huge imbalance in the flow of labour because England is the obvious place to go if work is scarce or wages are low. Wages are very low in many parts of Eastern Europe and so hundreds of thousands of Europeans come to the UK. 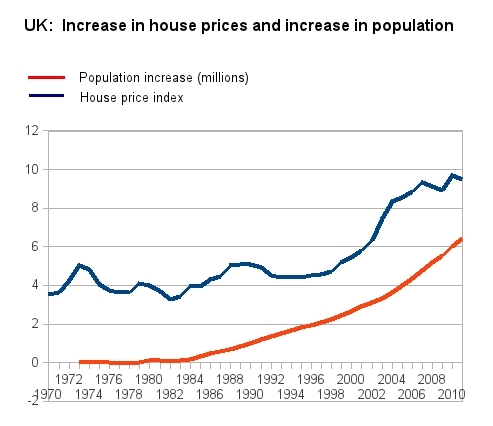 England has about half an acre of land for each resident, it is overpopulated, the huge influx of Europeans drives up rents and house prices so that the ordinary English person cannot afford a home. The influx also drives down wages which can be seen from the way that the UK has an ever increasing workforce but very low GDP growth. The influx also takes jobs from English people in times of recession. In the long run each migrant simply becomes another citizen of the UK, just swells the population. This means that migration is about population. If you love the English countryside it breaks your heart to see the ever expanding urbanisation due to migration fuelled population growth. The UK is likely to have over 70 million inhabitants by 2035, this is an unsustainable population that may be starving to death by 2100 if current predictions of climate change come to pass. The idea that net migration is so wonderful that it should continue for ever is insane, there will be an end point to population growth. There is no real physical possibility that the UK could sustain 200 million people so net migration will have to end sometime: the only issue is whether we let the UK become so overpopulated that no-one wants to come here any more or stop migration whilst the country is still vaguely pleasant. There have recently been strange arguments about free movement of Labour such as the scare story that European countries will repatriate British pensioners if Britain leaves the EU. This is absurd because the British taxpayer pays the pensions and medical care of British pensioners in the EU. No country would turn down this free money. The crazy truth is that Internationalism and the free movement of labour is racist, it destroys difference, both cultural and physical. Within a generation or two England will not be diverse, the English intermarry, within five generations Europe will not be diverse. Internationalism is favoured by those ultimate racists who want a world full of coffee coloured people all singing the same song. This racism is rooted in cowardice: fear of difference and fear of war. It despairs of nations living together according to law and opts for replacing this with global hegemony. Can you spot the Euro-Racism in this clip? “European Union rules allow the transfer of such fees within the bloc without tax deductions, but require withholding taxes to be levied when the fees are moved outside the bloc.” Individual countries, such as Holland, get around the problem of witholding taxes: “But Dutch tax law allows companies to send royalty fees earned in other countries on to tax havens without incurring taxes.” This means that companies can trade in Britain, charge the British part of their company millions for the priviledge of trading, take these millions in Holland without tax then transfer them to Bermuda, the USA etc. The European Union has designed its tax system to allow this tax avoidance. Defence and Foreign Relations Many people spotted that defence and foreign affairs were scarcely mentioned in the General Election. There is a good reason why this happened. The UK has signed the Lisbon Treaty in which member States agree to the EU setting the defence and foreign policy agenda (See What happened on November 1st 2014?). Although the UK may have an independent policy, if the EU regards an issue as important the UK must abide by EU policy. The current government is clearly viewing the new EU sovereignty over defence as a “Lisbon Dividend” that allows it to cut forces – see EU Defence Policy and British Forces. In practice, with the loss of the UK veto in 2014, the UK is no longer sovereign in matters of foreign policy and defence, the EU sets our policy. Universities and Further Education The EU provides about 900 million Euros per year in R&D funding, but the UK contributes about 960 million Euros to this R&D fund. It has been said that UK Scientists are being bribed with their own money to support the EU. Fortunately EU funding for educational purposes is largely available to non-EU countries as well as EU countries. See Business for Britain paper 27. In particular, the Erasmus scheme does not require EU membership. Dame Julia Goodfellow, President of Universities UK, which is agitating for continued EU membership, is a Board Member of the extremely pro-EU campaigners, British Influence, and she contributed to a 2003 paper that stated “There is no going back from the euro”. German aspirations If the Germans, from the outset, torpedoed the Euro as a currency that would serve both the North and the Mediterranean countries then what was their motivation? Anyone who has been to Northern Italy or Eastern Europe will have noticed that there is a cultural and architectural border that corresponds to the boundaries of the old Holy Roman Empire (ie: the Frankish/German Empire). This Empire was vigorous four hundred years ago. We easily accept that the Scots, Irish or Catalans might still be attached to a common culture from three or four centuries ago but the English “intelligensia” will simply scoff at the possibility that the Germans might have similar feelings. 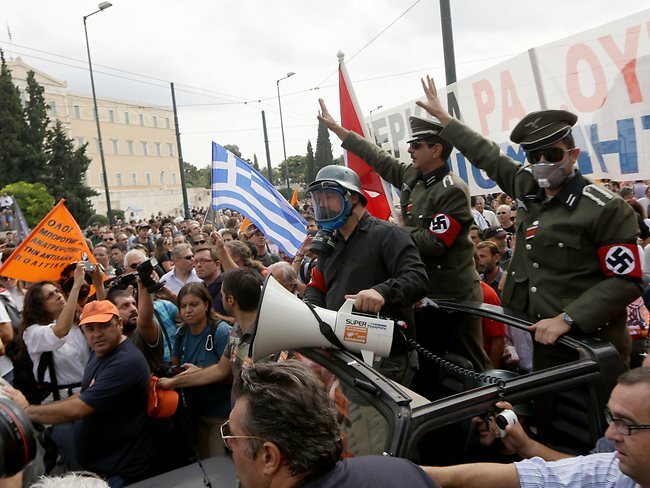 Despite two World Wars that transiently re-united the Empire and some modern German historians openly describing these wars as the “European Civil War” the British still believe that the Germans have no nationalist sentiment at all. The country that has benefited most from the Eurozone Crisis is Germany (See Reuters Report: Analysis – What Euro bailouts? Eurocrisis saves Germany money. ) The Mechanics of “Brexit” According to the Lisbon Treaty the UK must give two years notice of leaving the EU. During this period it will be possible to negotiate a Free Trade Agreement like that between South Korea and the EU or Canada and the EU. These involve zero tariffs and, in the case of Canada there is also an agreement for trade in wines and spirits that includes Geographical Indications etc. so even the Scotch Whisky exporters needn’t worry. The UK is in an excellent position because all of its exporters know what is needed to be compliant with EU regulations. The EU will not be in such a good position with compliance with UK regulations and this should benefit our Balance of Trade with the EU. 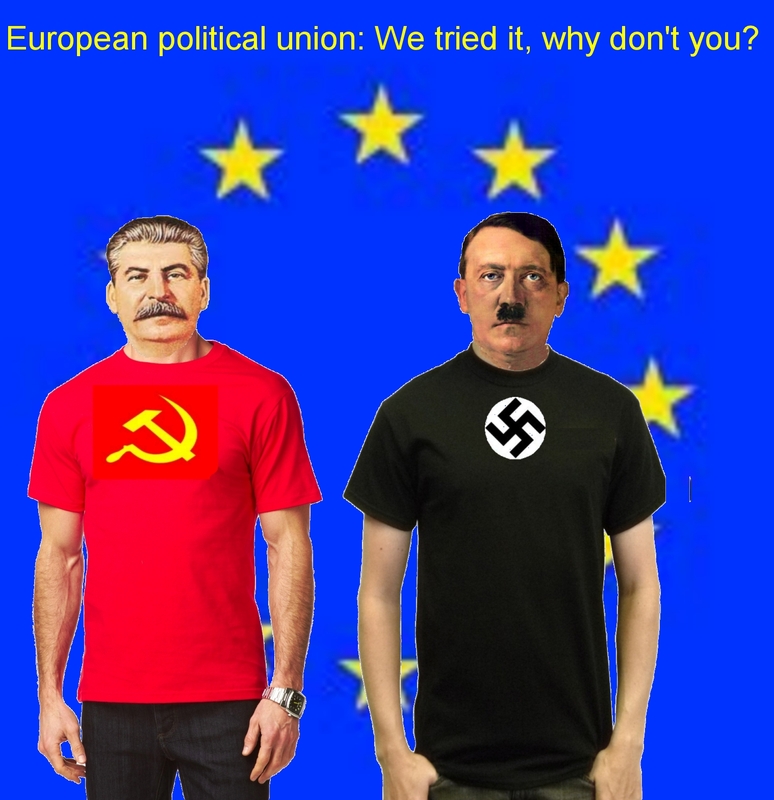 Are there any “pros” to being in the EU? Some people say it is better to be in a large country because that gives “you” power. No, “you” become just a 500 millionth part of the large country rather than a 60 millionth part of the UK. Big countries make the individual smaller. Do you really want to be part of a United States of Europe that plays military brinkmanship with the Russians, Americans or Chinese? Pro-Europeans say that Britain will have more influence if it stays in the EU but of course, it will be the United States of Europe that has the influence, not Britain. Some say that travel is so much easier in the EU but English motorists were just waved through border posts prior to the EU so ease of travel will be little different if England were outside the EU. The first is a financial union, with a single framework for supervising and resolving banks and for insuring customer deposits. This would build on the single supervisory mechanism now under development and ideally lead to a European version of the FDIC, financed by contributions from the private sector. The second building block is a fiscal union, with powers at the euro area level to prevent unsustainable fiscal policies and to limit national debt issuance. With these powers in place, a path towards common debt issuance would also be possible, but only at the end of the process. The third building block is an economic union, which would help euro area members to remain fit and to adjust flexibly within monetary union. This could entail, for example, moving from soft coordination of structural reforms in Member States to an enforceable framework at the euro area level. And the fourth building block is a political union, which aims at strengthening democratic participation. This final building block is equally important, as the other measures cannot be effective unless they are legitimate. This requires innovative thinking as regards the involvement of the European Parliament and national parliaments in decision-making on euro area issues. Note 3: “In France, a defendant is entitled to a jury trial only when prosecuted for a felony (crime in French) that is an offence which may bring least 15 years’ imprisonment” In Italy “Only serious crimes like murder can be tried by the Corte d’Assise.” ie: with a perfunctory jury. “In Sweden, juries are uncommon;” http://en.wikipedia.org/wiki/Jury_trial “Germany used jury trials since medieval times, but during an Article 48 (of the Weimar Constitution) state of emergency, and about one month before the February 1924 trial of Adolf Hitler for the Beer Hall Putsch of November 1923, the Emminger Reform (a Notverordnung, or emergency decree) was passed in January 1924 abolishing their use and replacing them with a mixed system of judges and lay judges which is still used today.“ http://en.wikipedia.org/wiki/Judiciary_of_Germany Note 4: Balance of Payments Deficits Commentators often simply shrug off the UK-EU balance of payments deficit but it is a persistent and extremely large deficit. There is a succinct summary of the effects of a large and persistent deficits at Balance of Payments – Trade Imbalances which notes the following adverse effects: What are the Key Dangers from running Persistent Trade Deficits? The actual trade figures are given in The Benefit of the EU for UK Trade and Industry. About 65% of UK trade is now non-EU and it is growing fast. Your idea that Brazil, India, China, South East Asia are all “tin pot” states is puzzling and refuted by the trade figures. Current EU tariffs on Japanese cars are 10% if they are produced in Japan and 0% if produced in Sunderland. South Korea has an FTA with the EU that eliminates tariffs on cars and a similar FTA should be possible between the EU and UK on Brexit. On the subject of Nissan, it is probable that Japan will achieve an EPA with the EU within 2 years. This will almost certainly allow Japan to export cars direct from Japan at 0 or near 0% tariffs. You will find that the data given in this article and related articles on this site are based on source data, not the Daily Express – follow some of the links in the article.